This week is the week when Josh’s life changes. The scene that has been running through my head all week is the one in Peter Pan where Tinker Bell is captured and she’s dying. And the appeal for everybody watching to believe in her…to clap their hands and just believe the little pixie will live. I feel like that for Josh this week. I want with the same kind of plea I saw in Peter Pan for Josh to find his voice tomorrow. I want to call out to everybody I see, and know, to believe that my son will speak. Its the most bizarre feeling to live with a child for 33 years. To see how bright his eyes are; how spontaneous his laughter; to know that inside his head is an intelligent, motivated, and creative man… and yet not know his ‘voice’. I’m hoping, and praying that what we find tomorrow will change our lives. He wants to speak. I want to hear. So I’m hoping that anybody who knows him will hope and pray with every ounce of their being tomorrow that the big miracle will happen. That Josh will finally be given the ability to speak. All we need is a chance. Josh will take care of the rest of it if the equipment will just allow him access. Joshua Englehaupt was born on April 3, 1980. 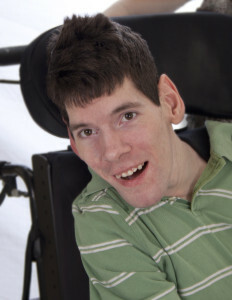 Birth trauma left him with Cerebral Palsy. He is non-verbal and non-ambulatory but he is filled with a wonderful spirit. He has a passion for art. Join him in his journey of discovery. I’m already hoping and praying with everything in me. Just reading his blog brought me to tears. He wants this soooo badly! And so do you. Thank you, Marti. The more positive energy in the air tomorrow, the better. Praying with all my heart! What an amazing opportunity this is. Wishing you both a day full of hope! It was an amazing day. I signed the paperwork and Josh will get to try both systems for an equal amount of time before he chooses. He will get a ‘voice’. what he does with it is up to him. The systems will do whatever he chooses for them. I am so very blessed to get to watch it happen. He’s amazing. Thank you for stopping by and commenting.